I’ve taken to calling the marks in my skin my “war wounds.” They are the scars that remained when the fight was finished, and the evidence that I was stronger than that which had tried to harm me. Each one is a memory—some more blurry than others—that I would rather forget, but won’t relinquish. They are as much a part of me as the pigment of my skin, the freckles that dot it, and the shape of my eyes and mouth. Undeniable. And there are many of them. I self-harmed from the age of 12 until my early twenties, often as a way to unravel and relieve the confusion around my sexuality, gender, expectations, and mental health. It became a crutch and an addiction. At 31 now, I’ve been clean for years, but the evidence remains. I made the decision to stop hiding the scars that litter my skin, to stop excusing them as accidents or mistakes, on a hot day over summer a year ago. We don’t get many of those kinds of days in the UK; a day where plants and people alike are wilting under the weight of the sun. It was too hot to be out; too hot certainly to be leaping and running, for the kinds of team challenges and acerbic banter that make a day spent practicing parkour healing for the soul. It was too hot, without a doubt, for the clothes I was wearing. We’ve been friends for long enough that I know to listen to him when he gives me advice. He’s talked me through climbs at heights that made my stomach lurch, and through jumps I wasn’t sure I could stick. I trust him. So I stripped to my sports bra, rolled my trousers up to my knees, and got on with it. It was a good day, full of sweat and laughter and cheering. It wasn’t until afterward, when I looked back through the photos and videos of that day, that I came across an image that caused me to pause and think about why I felt the need to hide my body. The photo wasn’t anything special, a series of shots snapped during a tac-to-arm leap, a move where you push off one wall to hang by your arms on another. I’d never managed one before and had been excited to land this one, but suddenly the move seemed unimportant because all I thought was: scars. I saw them on my arms, could picture those on my torso, I even imagined seeing the ones on my legs, under my heavy, army-surplus trousers. And then I saw the little girl. She’s in every photo, standing behind where I was training, her face is lit up with what appears to be wonder. What that little girl was seeing wasn’t my scars; she was seeing a woman without shame—a woman using her body with pride to move through the walls and railings of the park. I put the pictures on social media and promised myself that if anyone ever asked, I would tell them the unfiltered truth. I’ve yet to break that promise. Shame is a group concept. It can grow through public disapproval or it can be seeded in silence. I know how hard it can be to look a person in the eye and admit that you self-harmed. It’s scary, and it’s scary because the unrelenting silence around harming breeds fear and shame, but it doesn’t have to. There will be people who will understand. You aren’t broken. It may not feel like it now, but you won’t always carry this burden. You will beat this, and you will come out of it an even stronger person. 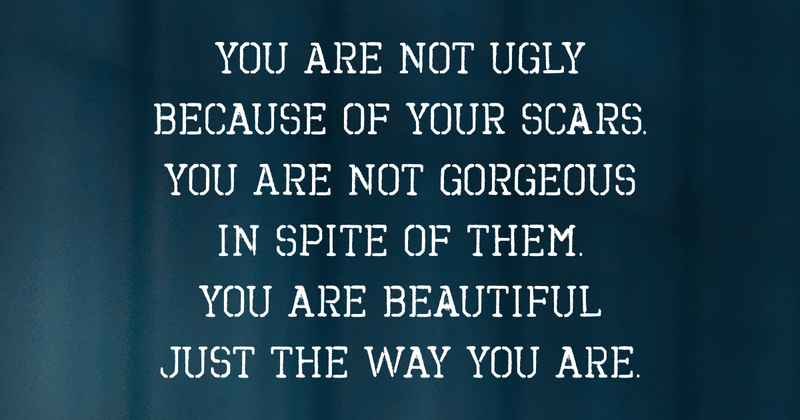 I want to tell you this: You are not ugly because of your scars. You are not gorgeous in spite of them. You are beautiful just the way you are—war wounds and all. You will beat this, but you may have to fight for awhile. I’m 34 and still fighting. There is pride in the process, the honesty. Thank you for the inspiring, heartfelt story. You truly are one magnificent human being. I have many “war wounds” as well. Keep doing you! I hope you start to see your purpose and accepting your past. You will beat this! What a powerful thoughts and emotional empowerment really love reading it thank you for sharing. I’m so proud of you and your strength and I want to say thank you . I can reread your blog over and over again. Could we talk some time? I understand what you went through. I am still struggling with my pain and am finding it hard to get through. Im not Okay… but I’ll say I am… Lets breath one day more… Its not a big deal.. Everyone goes through it… everybody s enduring. Please know that you are someone and it is OK to be honest and say that you’re hurting. You and your struggles are welcome here. Would you email our team at info@twloha.com? We would really like to offer you encouragement and support. I am a mom of a beautiful 19 yr old daughter who has recently revealed that she has been self harming for 5 yrs. My heart was broken with the revelation that she has felt she needed to hide and had been suffering alone all this time. I love my baby girl, and right now all I desire is to help empower her to believe that she is not too far gone. I’m so thankful for TWLOHA and the resources here. I am not alone in this battle for my daughter.